This kind of made me smile today so I thought I would share. In an attempt to better familiarize you with some of the funny quirks of being from NC, which I have to admit has its share of quirks that set it apart from other parts of the southern U.S., I thought I would share this post that I came across today with a few of my own comments and experiences. Yes, this post may be written for folks like you, Natasha, and you, Natalie, since NC is probably so different from your parts of the country and world. 1. You have very strong feelings about Duke, UNC, and NC State. Um, yes, you could say that although I have definitely toned those feelings down in recent years. One of the biggest differences between NC and other southern states is that while most southern states are huge college and professional football addicts, NC is very serious about its college basketball. I attribute this to our schools being in the ACC (Atlantic Coast Conference Division) as opposed to other southern states who are in the SEC (Southeastern Conference). The SEC is primarily made up of schools that put more into their football programs while the ACC schools love basketball. Growing up, my family was very pro-UNC so I adopted that love from them. When I went to college at a small all women’s college in Raleigh, NC, I developed a love for NC State as I was right across the road from the campus and spent much of my time there. (And of course, this had nothing to do with boys! I mean, come on, what kind of girl do you think I am? Haha!) But yes, I did just happen to meet my future husband there. Eddie is actually more of a football fan than a basketball fan because NC State has been notably better at football. We are both pretty ANTI-DUKE though! Haha! 2. You know Cheerwine is not actually wine but one of the greatest carbonated beverages ever. Well, I am familiar with Cheerwine, and although I do try to stay clear of carbonated, caffeinated, sugary and unnatural beverages (sweet tea does not count), I have enjoyed this beverage once or twice. Yes, it was “born” right here in my current hometown of Charlotte, but you can thank our wonderful state for many of the beverages you know and love (Coke and Pepsi drinkers, that means you!). 3. You have gotten into fights about what style of barbecue is better. Okay, not actually physical fights, but maybe a few arguments. There are many different meanings behind the term barbecue so perhaps I should explain further for educational purposes. NC is divided into three distinct regions (Eastern Coastal Plains near the coast, middle section called the Piedmont, and the western Mountain area). Although I can say I was born in the western part of the state, I was “raised” in the eastern part of the state for most of my young life. I do have to agree with the author of the post, eastern is the best. In NC, when we talk about barbecue we mean pork. Yes, we love eating pigs around here. Haha! We barbecue the whole pig (you’ll see more about this down the list) on a big grill and then cut the meat off. Now is where it gets tricky. If you are in the east, you’ll want to finely chop the barbecue and for my taste remove as much of the fatty parts as possible (doesn’t that sound yummy?). Then, we cover the chopped meat with a yummy concoction of spices in a tangy vinegar base. Trust me, it is the best! In the western part of the state, you find what is called pulled pork barbecue. They don’t chop the barbecue but instead just pull it apart by hand into large pieces and then cover it in a traditional tomato based barbecue sauce. Of course, if you are like my husband who could eat anything smothered in mustard, you may prefer South Carolina’s “yucky” mustard based sauce. Haha! Of course, if you go to Texas, you’ll find a totally different meaning to the term barbecue and other places will use the term to loosely refer to anything cooked on a grill, but we are pretty picky about our use of the term here. 4. You know it’s no fluke Asheville has been named Beer City for three consecutive years. Well, actually, I didn’t know that, but I did know that our state loves its beer. We actually do have many local breweries around here. I have been to the Weeping Radish Bavarian Restaurant which was NC’s first brewpub and is located in Manteo on Roanoke Island (home of The Lost Colony). We lived in that area during our first years of marriage, and we celebrated Oktoberfest there one year. 5. You know ya’ll is a perfectly grammatically correct way to refer to a group of people. Yep, it is, ya’ll! Haha! Okay so I don’t really use this term professionally, but I get it and love it! 6. You know tea is always better sweetened. And with ice! Haha! Hey, we live in a hot and humid climate so there is nothing better than a cold glass of sweet iced tea on a hot day. However, I have actually had to start asking for half unsweet at many establishments in recent years as many places do overdo it on the sugar. Seriously, it should not taste like syrup, folks! Sigh, it is seriously a work of art to master the delicate balance of making this delicious beverage. I have actually mastered it at home and taught my husband so we usually have a nice concoction waiting at home in the fridge whenever you come for a visit. 7. You have a favorite NASCAR driver. Sigh! Seriously, I could do without this one. Well, actually, my family did teach me an appreciation for the beloved Dale Earnhardt (#3) until he died in 2001. But really, I could never sit and watch one of these races all day. I guess the only way to do it is to get really drunk. Ha! I mean you are just watching a bunch of cars going around a track like 500 times, and the only excitement is when someone wrecks. Moving on, folks. 8. You’d happily live off of Bojangles’ biscuits. Seriously! I love Bojangles! I know it sounds like a cajun restaurant, but it was born right here in Charlotte as well and has spread across the south. It is a chicken fast food chain, but unlike the more widely known KFC, Bojangles does have a cajun flair, and their chicken has a spicy mixture in the breading. The yummy biscuits are also a treat that kind of make you think of our grandmothers’ homemade buttermilk biscuits although nothing could compare to those. 9. You know the proper pronunciation of Appalachian. …as in the mountains. Yep, it is App-a-LATCH-un! 10. Grits and/or biscuits are staples of any good breakfast. Yes, and I don’t get a “good” breakfast very often. Grits are good with a little salt, pepper, and butter although some cheddar cheese melted in them is also a treat. 11. You still have beef with Ohio. This one just made me laugh. First in Flight. Thanks, Wilbur and Orville, for choosing to fly that plane on the NC Outer Banks! Yes, I guess I do, but no slaw for me, please! Ha! 13. You know no holiday or big family dinner is complete without greens. Collard greens that is. Well, this was the case when my Granny was alive! Haha! I do enjoy a drive in the mountains to see the beautiful fall colors on display although my susceptibility to car sickness doesn't make this very practical. 15. Seeing a Florida license plate drives you into fits of rage. I don’t know about this one, but bad drivers in general will do that. Ha! It sounds like this is a mountain area thing because all those snowbird retirees like to head to the mountains to see those leaves changing color. 16. You watched the ACC Basketball Tournament in class. Maybe once or twice depending on who my teachers were. March Madness, baby! 17. You had a snow day…without any snow. In our defense, our weather has been notably unpredictable. They predict snow, we probably won’t get any. They don’t predict snow, we’ll get dumped on. Ha! 18. You have an appreciation of bluegrass. 19. You’ve attended a pig pickin’ or two. See number 3 above. This is a social event where we all get together and cook the pig and make our wonderful barbecue. It is awesome, ya’ll. I haven’t actually done this since living in the eastern part of the state though. We can feed lots of folks with a whole pig. Ha! 20. You like to brag about the NC music scene. Seriously, ya’ll, James Taylor will win anyone over to this state. Just google Carolina in my Mind. 21. You have friends who have done some cow tipping. Um, I probably do, but I’d rather not know about it. Yes, I grew up in a very rural small town. 22. The Lost Colony fascinates you. Seriously, ya’ll, we do have the best history of any state! Yep, we have a history of notorious pirates. What’s not to love? And our coastline is eerily called “the graveyard of the Atlantic.” Spooky, huh? 24. You’ve jumped off Jockey’s Ridge. Um, no, those people are crazy. That thing is huge. I love watching people windsurf off of it though. 25. You have a favorite swimmin’ hole. Oh, I’ll take a cool dip in a mountain stream or a refreshing dip in the ocean on any hot summer day. We are lucky to have both here within a few hours driving distance. 26. You know the best time to visit the Grove Park Inn is during gingerbread house time. This is referring to the Biltmore House estate in Asheville, NC, the 8,000-acre estate created by George Vanderbilt and known as America’s largest house. You can stay at the Inn although we haven’t because it is pretty expensive, and we haven’t been able to justify a visit yet. With its elaborate gardens, I could see this as a great vacation destination for you, Natasha! 27. You know the importance of preferring light blue over dark blue. I am intentionally leaving out the vice versa here because who in their right mind would prefer dark blue? The light blue means the UNC Tarheels and dark blue refers to the Duke Blue Devils. We say there is a reason God made the skies Carolina blue, folks. 28. There was a plastic jug of moonshine in your freezer. Um, no. Must be a mountain thing. 29. You know the Cook Out tray is the best deal. Ever. Um, maybe for broke college students. Cheap greasy burgers and fries…perfect college food, right? A corn dog as a side, really? Ugh! No wonder people are so unhealthy these days. 30. Christmas Town , USA, is the bane of your existence. This is a little town just west of Charlotte and just off one of the major interstates in our state, Interstate 85. I have never had the need to head this direction during the Christmas season so I have missed the traffic problems this causes every year on the interstate as traffic backs up for miles with people wanting to drive through the town and look at Christmas lights. Hey, I love Christmas lights as much as anybody, but I have my limits. 31. You were eating Krispy Kreme doughnuts before they got all popular and trendy. Seriously, I was. I actually took them for granted as a kid. We just happened to live in the town that has one of the oldest stores so I’ve been around this treat since I was very young. Stores have really started popping up everywhere lately and becoming more popular. It is a treat to go into the store and look through the glass to see those circles of dough going down a moving assembly line, turning golden brown under the heat of the oven, and then being drizzled with yummy sugary glazed goodness. And if you are lucky enough to get them hot off the line when the light is on, they will melt in your mouth. Sigh! I am giving myself a craving typing this. Ha! 32. “Wagon Wheel” will never, ever get old. Ooops, I don’t really know much about this one. I mean, I’ve heard of the song, but I don’t get the craziness. 33. The sight of this brings you joy. 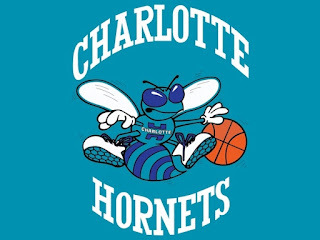 Yes, they just announced that the Charlotte Bobcats (our NBA team) will go back to being the Charlotte Hornets. 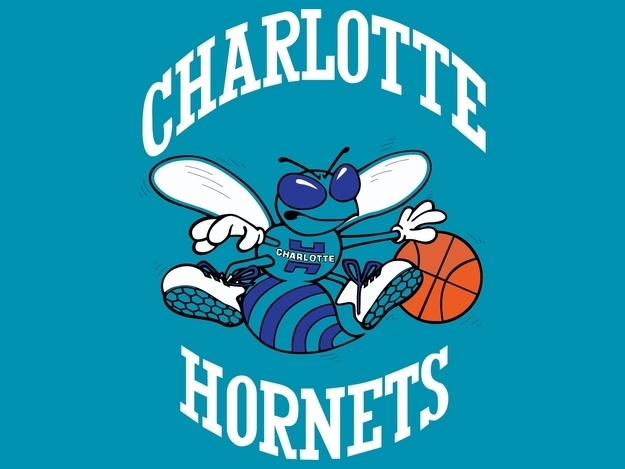 There is a whole crazy history about this one, but the team was the Charlotte Hornets back when I was a kid, and the name definitely has more sentimental meaning for our area than the Bobcats which apparently was ingeniously derived by the former owner of the team who also owned BET and wanted the team named after him or something. The team is now owned primarily by Michael Jordan. I don’t know if changing the name will help the team win more, but we welcome the change. 34. And the sight of this reduces you to tears. Sigh, again. Oh Panthers. 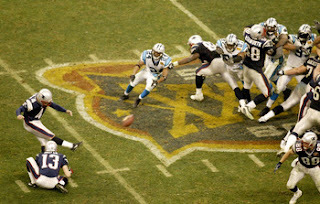 This was the year we almost won the NFL Super Bowl championship (and in retrospect if they had been able to review the play back then, we would have won). Oh the taste of disappointment! 35. You had no idea hockey was an actual sport until this happened. Yes, we really weren’t big hockey fans until we got our own team, the Carolina Hurricanes, and they won the Stanley Cup. I still am not a big fan though. The sport seems brutal! 36. Speaking of hurricanes, you’ve lived through one. Oh, several actually! I have fond memories of hurricane survival through some of the roughest storms to hit our area. One named Fran hit on my 16th birthday…what a wonderful way to celebrate, huh? We usually know that if a storm bypasses Florida and the gulf and continues north in the Atlantic, the warm waters of the Gulf Stream are going to direct it right into our coastline which does kind of stick out there into the ocean. 37. You’ve figured out some creative ways to get around blue laws and the lack of happy hour in the state. Um, no, I have not. 38. And when the state disappoints you, you still ardently defend it. It’s kind of like family. You can criticize it, but you won’t stand for any outsiders doing it. Haha! That is so funny! Some of these sound like Oklahoma and then some I've never heard of. LOL! We are State fans too (my sister went there) and growing up I was a big UNC fan (thanks Eric Montross). I must say I am a bad southerner/Carolinian because I DO NOT like tea- sweet, unsweet, hot...yuck! I do have a disdain for OH and FL drivers but that's due to lack of attention on the road! Cheerwine and Bojangles are AH-Mazing- but I agree on CookOut being for broke college kids! I do own my own PERSONALIZED flask- but must confess I rarely take it anywhere (it was a 21st birthday present). And finally- the ONLY hurricane I remember is HUGO! Thanks for this post Sherry! The barbecue, the beer and the grits are making Dave want to visit more. Okay, when I come visit I will have to get some Cheerwine. I love all things carbonated. It's my one vice :) And I want "sweet tea" as ya'll drink it! I will always pronounce Appalachian correctly now. And what is a burger "all the way"? And now I need to go Google "The Lost Colony" and why ya'll have a beef with Ohio! I DEFINITELY want to check out Grove Park Inn now. Did you say "gardens"?!?! And I can't believe you didn't know what hockey was until the Hurricanes came along!!! I grew up watching hockey every Saturday night -- it was the thing to do. I am definitely not from NC because I was clueless about a lot of these. The Cheerwine sounds really tasty! And I want to know more about this all the way burger. Mostly just because I want a burger right now!